Ground Penetrating Radar Systems, LLC. of Colorado was contacted by Golden Triangle Construction of Fort Collins to locate rebar in concrete slab. Golden Triangle Construction needed GPRS to scan and locate reinforcement to build a wall off of existing concrete footer. The inspection was needed to know how much reinforcement was in the footer before cutting into it. GPRS went out to scan and locate rebar in a fast and reliable manner. GPRS used a GSSI 1600 MHz Antenna to locate the rebar. All findings were marked directly on the surface at the customer’s request for easy interpretation with permanent marker. 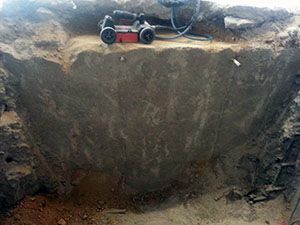 GPR was needed for this job to keep the customer from saw cutting into or through rebar and damaging the structure. 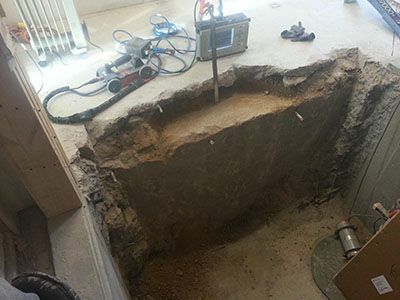 Ground Penetrating Radar was reading no reinforcement that our equipment could see close to the saw cuts. Ground Penetrating Radar Systems use safe and cost effective methods to conduct GPR investigations. Ground Penetrating Radar is like a concrete X-Ray but is safe to be around while concrete imaging is taking place, emitting no radiation unlike concrete X-Ray. 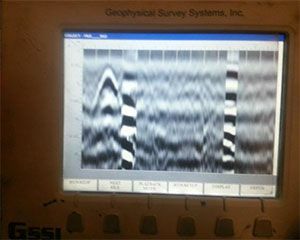 GPR can also give immediate markings without having to process films. GPRS can perform concrete imaging investigations on big or small areas to locate post-tension cables, rebar, underground storage tanks, plumbing or electrical conduits. If you need a similar concrete imaging scan on your job site please feel free to contact Kevin Salazar (Project Manager) at (720) 498-3834 or e-mail at kevin.salazar@gprsinc.com for the surrounding Denver counties such as Arapahoe, Centennial, Adams, Jefferson and Douglas.